A key part of most Office 365 deployments is directory synchronization with on-premises Active Directory (AD). To maintain a link between individual object in AD and Office 365, one attribute in AD is defined as the source anchor. The source anchor acts as a unique identifier for each object so that you can change properties like UPN and have them replicate to the proper matching object in Office 365. Older versions of Azure AD Connect used the objectGUID attribute as the source anchor. In many cases, this is a good choice because it is an attribute that doesn't change. However, in complex configurations with multiple AD forests, this can cause an issue during migrations. When a user account is moved from one AD forest to another, it gets a new objectGUID in the new forest. Due to the new objectGUID , Azure AD Connect treats the user as a new user instead of an existing user. To avoid this issue, we need to use an attribute for source anchor that can be moved between forests. Microsoft now recommends that deployments of Azure AD Connect use the mS-DS-ConsistencyGuid attribute as the source anchor. Unlike objectGUID , this attribute can be modified. So, it can be maintained when users are moved between forests. I've just recently completed this process and I'll provide some general guidance (for my own reference) and a few items that I didn't see anywhere else. First, read the information from Microsoft on updating the source anchor. You'll need to scroll down a bit to the heading "How to enable the ConsistencyGuid feature - Existing deployment". If you're like me, before attempting this you'll scour the web looking for information about how to fix things when they go wrong. Unless things change a lot after I write this, you won't find much. The reason you won't find much is because the wizard does exactly what it's supposed to. Note: The wizard does not ask you which attribute you want for the source anchor. It is assumed that you want to use mS-DS-ConsistencyGuid. When the wizard is done, a full sync is triggered for all connected forests. As part of the full sync Azure AD Connect reviews the value of the mS-DS-ConsistencyGuid attribute. If the value is blank, the objectGUID value is copied into the mS-DS-ConsistencyGuid value. 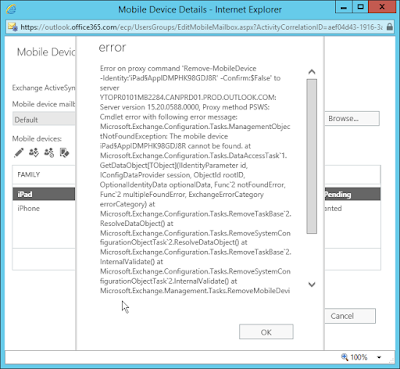 Then on the next sync cycle the mS-DS-ConsistencyGuid value is sent to Office 365. The Modify AD FS Claim Rules section in the above link has four rules. The net effect of these rules is to use mS-DS-ConsistencyGuid if it is populated and use objectGUID otherwise. This avoids downtime when AD FS rules have been modified but the mS-DS-ConsistencyGuid hasn't been populated yet. If you have let the installation and configuration wizards for Azure AD Connect manage all of the service account permissions and AD FS integration, there should be no issues. 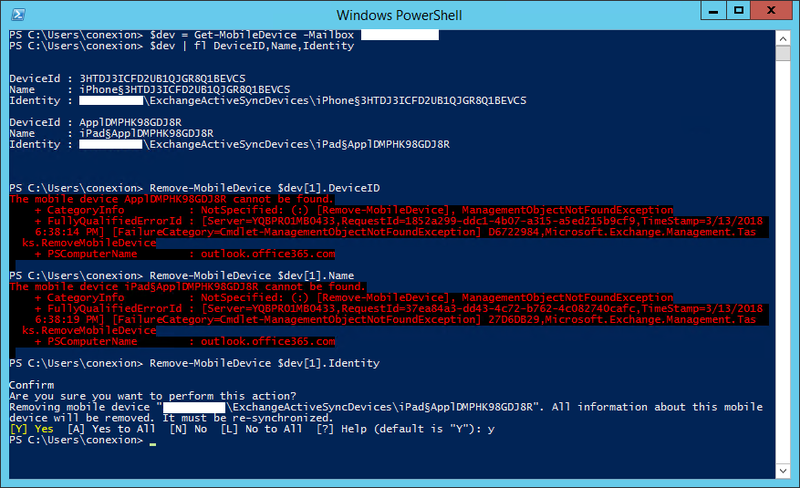 However, if you've been manually configuring the permissions and AD FS rules, you might need to make changes manually. dsacls.exe "dc=contoso,dc=com" /I:S /G "contoso\serviceaccount:RPWP;mS-DS-ConsistencyGuid;user"
The above command grants (/G) inheritable (/I:S) permissions to the service account to read (RP) and write (WP) the mS-DS-ConsistencyGuid attribute on user objects. Review the AD FS claim rules for Office 365 and verify that they were modified. Review the mS-DS-ConsistencyGuid attribute on several user objects to verify that it has been populated. On one deployment, we had an error in the Azure AD Connect full sync for one domain immediately after finishing the wizard. The domain that finished properly updated the mS-DS-ConsistencyGuid attribute and the domain with the error didn't. Running an incremental sync didn't fix it. We needed to force a full sync again to get the attribute updated properly. When viewing the value of the mS-DS-ConsistencyGuid attribute in Active Directory Users and Computers, the value might be displayed in special characters for some users. This is a display error in Active Directory Users and Computers. This is not something you need to fix. 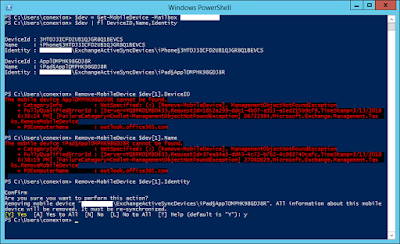 I was still able to remove the device by using a Windows PowerShell prompt connected to Exchange Online. 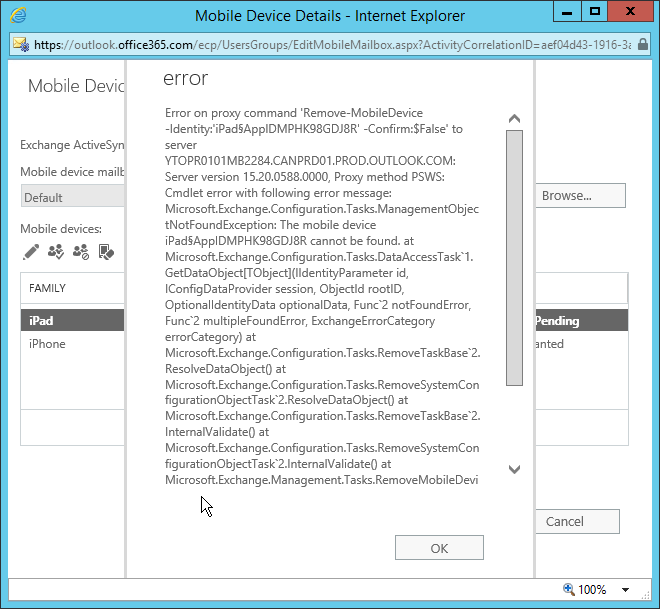 But what I noticed is that for the Remove-MobileDevice cmdlet to work, I needed to use the Identity property from the mobile device rather than the Name property that the Exchange admin portal was attempting to use. You can see in the screenshot above using the Name or DeviceID properties didn't work. Only the Identity property which includes the full path with the user name works. I've opened a support ticket with Microsoft and we'll see what they come back with. It was not a know issue when I contacted them, but they're going to do some checking on the back end. I will update this blog post when there is a resolution. So, support indicates that it's definitely an issue, but to raise visibility with the support team they asked me to create an "idea" at office365.uservoice.com. This location seems more for feature requests than bug fixes. However, I've put an "idea" in. I'll continue to update as I learn more. My client has informed me that this issue has been fixed. I'm not sure the date, but you should no longer see this problem.